We are 3 weeks away from General Conference and I’m sure it will be here before you know it! I always enjoy General Conference weekend, and I especially love the Spirit that is felt in our home and the amazing talks that are heard. Each year I plan on trying my best to prepare myself and my family for General Conference, but most of the time I don’t get to plan for it as well as I’d like. A few weeks ago, while school shopping, I came across these great weekly planners in the $1 Spot section at Target. I had an idea, so I bought a few and made plans to create a fun little gift for myself and for some friends to help us prepare and plan for General Conference. These General Conference planners would be great for your VT sisters, YW, YOU, friends, really…anyone! 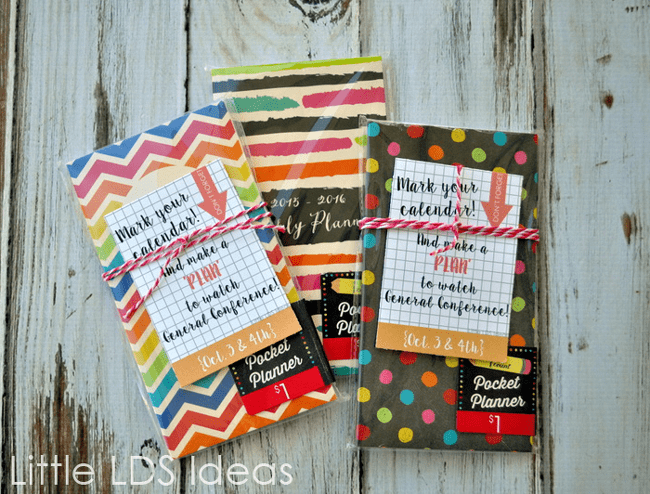 You have exactly 21 days until General Conference…here’s what I plan on doing with my planner. For the next 21 days, I am going to write down a way I can prepare myself and my family for General Conference. It doesn’t have to be something really big or time consuming. Maybe for a few days I will think about questions that I might have or topics/things I need help with. I might write down on a day to take a little extra time to pray about those questions/topics that I might need an answer to. Other days I might plan on reading a Conference talk from the April session, read my scriptures, do some service. Mondays I will plan some special Family Home Evenings focused on General Conference. Sundays I will plan on studying talks, scriptures, Ensign articles, etc. How do you prepare or plan for General Conference? First, find some weekly planners. I’m not sure if all Targets will have these awesome weekly planners, but it’s worth the trip to take a look (unless you live an hour away from your closest Target like I do). I’m sure you could find some at Dollar Stores or other office type stores. Next, print out my General Conference Planner tags. I fit 6 tags to a sheet to save on printing. 🙂 Here’s what the tags look like! These would be great to hand out to your Young Women! They could count this as Personal Progress Value Project! Have them choose a specific value, and then have them study scriptures, talks, articles that have to do with that value over the next 21 days. After the 21 days (or however many days they choose) have them write what they learned in their journal. They can fill out their planner each day with how they will study that value. 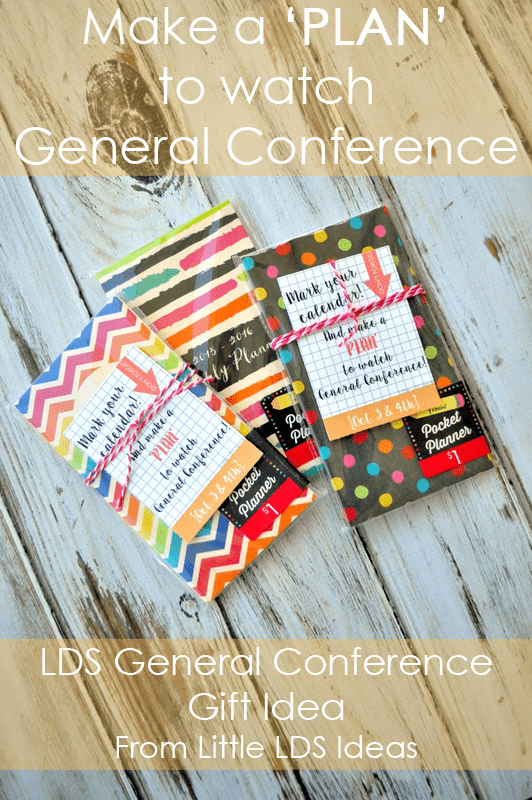 Click HERE to print my General Conference Planner Tags! I’m so excited to fill up my General Conference Planner. Will you join me in ‘planning’? I sure would love it if you did. 🙂 And I’d love to hear how you plan on preparing for General Conference. These will be great for the sisters I visit teach, thank you Sheena! Great idea Sheena! Great way to cross off Personal Progress and prepare for General Conference. I love these! Great idea, thanks. That is darling! What a fun idea to do with Activity Day Girls, too! Great ideas for my classes., I love it. Thank you so much!